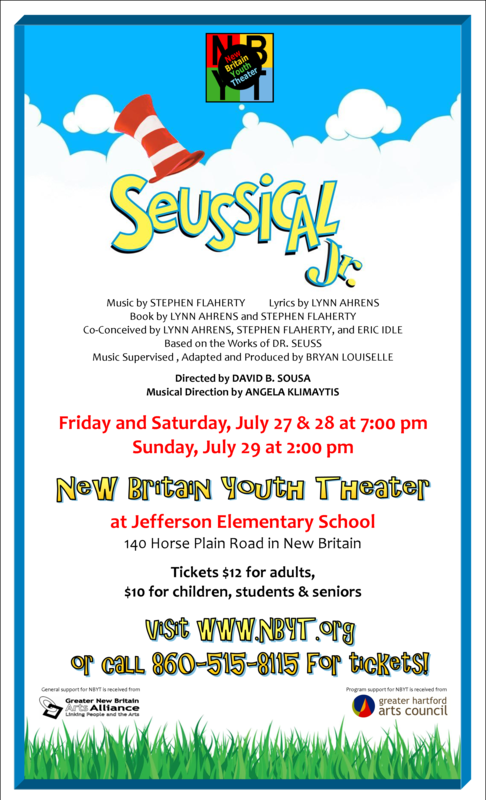 Auditions Scheduled for SEUSSICAL JR.
NBYT will hold auditions for its summer production of Seussical Jr. on Sunday, June 24, and Monday, June 25, 2012, at Trinity-on-Main Performance Center Annex at 19 Chestnut Street in New Britain. Sunday hours are 4:00 – 5:30 p.m. Monday hours are 6:00 – 7:30 p.m.
Rehearsals will be held over a four-week half-day program on Mondays through Fridays from July 2 through 27 (except for July 4). Rehearsal hours will be 9:00 a.m. to 1:00 p.m. Performances will be July 27, 28 and 29, 2012. In addition to rehearsing, the cast will also help to make some of the props and costumes for the production. Rehearsals and performances will be held at Jefferson Elementary School on Horse Plain Road in New Britain near the Farmington border. Those auditioning should prepare at least eight lines of a song, preferably from musical theater, to be sung a cappella (without accompaniment). Children auditioning will also be asked to read from a script and may also be asked to sing from the musical. To schedule an audition and learn more about the program, call (860) 515-8115 or email auditions@nbyt.org. Children who register for the program prior to auditions will be given preference, but auditions are open to all children ages 7 to 14 from any town. The participation fee for this program is $295. Although the full program is limited to ages 7 through 14, NBYT is also offering children ages 5 and 6 the opportunity to join rehearsals during the final week to be part of the cast for any or all of the performances. As with the full program, all children who register will perform in the show. Based on the stories of Dr. Seuss, Seussical Jr. takes place in a world where anything is possible when favorite books and characters come to life. When Horton the Elephant goes out on a limb to save Whoville and protect the egg of his neighbor, Mayzie La Bird, adventure begins in the Jungle of Nool. It’s going to take the Cat in the Hat, the smallest of the Whos, and a flock of Seuss favorites to save their world! This “Broadway Junior” version of the script is designed specifically for children to perform. Seussical is a fun-for-all-ages musical, even for children who have seen or performed in it before and may notice more of the dozens of references to Dr. Seuss’s characters and books. Conceived by the Tony Award-winning team of Lynn Ahrens (book and lyrics) and Stephen Flaherty (book and music), along with Eric Idle of Monty Python fame, the Grammy-nominated score features a variety of musical styles, including pop, ballads, gospel, blues, and R&B. For more program details, registration forms, and general information about New Britain Youth Theater, please visit the On Stage page of the NBYT website or call 860-515-8115. NBYT Auditions Scheduled for SEUSSICAL JR.